The Government of Manitoba’s strategy to enable individuals with barriers to employment access to meaningful work through social enterprise is part of a larger provincial job creation strategy launched in 2012. As reported by Statistics Canada, unemployment affected 6.1% of Manitoba’s population at the end of 2015. In 2009, Manitoba had the highest First Nations’ unemployment rate for off-reserve adults age 25-55 in Canada, at 71.8%. While the goal of the Provincial strategy is to remove barriers for any individual prevented from successfully participating in the workforce, this analysis is focused on four social enterprises serving off-reserve Indigenous individuals seeking to integrate into full time employment. The four social enterprises studied were: Building Urban Industries for Local Development (BUILD), Brandon Energy Efficiency Program (BEEP), Manitoba Green Renewal (MGR) and the Genesis program within New Directions. 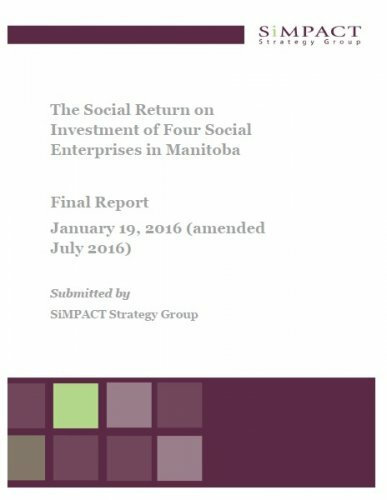 Two other social enterprises, Inner City Renovations and the North End Renewal Corporation (NERC) were originally included in the study, however, this analysis occurred during a period of significant redesign for both organizations. The analysis was reduced to four social enterprises as a result however key findings and evaluation tools are to be shared across the original group of six. Since 2013, the Department of Housing and Community Development of the Government of Manitoba (Manitoba Housing) has been purchasing renovation and repair services from a number of social enterprises. In the course of purchasing these services, the Department deliberately pays a premium of $2.56 M, as an investment in the ability of its social enterprise vendors to remove long-term barriers to employment that would be otherwise facing their employees.